Creative talent in the adventure sports capital. Between the spikes and ridges of the Aiguilles Rouges, the mountain range on the north western side of the Chamonix Valley that faces the Mont-Blanc range, is a plethora of small alpine, once glacial, lakes that link the upper altitudes to the rivers and gorges below in a chain of icy waters. 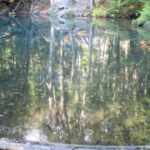 As a committed wild swimmer, who moved to the mountains after five years’ living on the seas, when I clocked these random blue patches, some linked by ribbons of stream trails, on a map of this French national park, I vowed to take to some such lofty waters. I have always loved swimming under the sky and the concept of doing this at over 2000 metres of altitude being all the more appealing, as I would feel that much closer to the heavens. Not just a wild swimming addict, I also thrive on watery adventures to the point just before being an adrenalin junkie. I’ve dived off sail-boats into four kilometres’ depth of the big blue in both the Pacific and Atlantic Oceans and jumped naked into an Aegean Sea so clear, I could see the sparkling sands of the seabed 20 metres below. Wherever I go in the great outdoors, I carry a bikini (life is always interesting when you’re wearing one) and if I come across a possible swimming spot, then I have to get wet, whatever the weather. 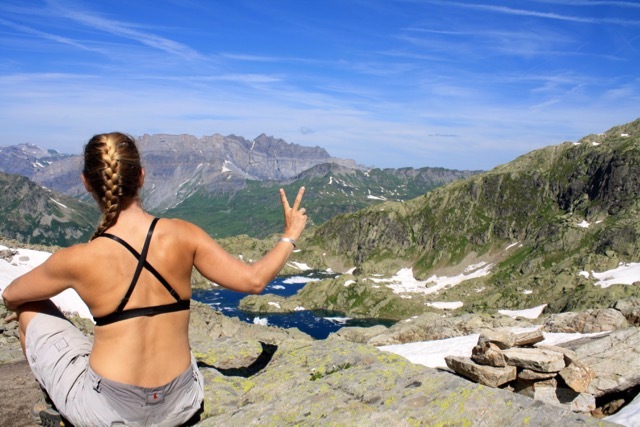 I moved to the Alps of Haute-Savoie because I was chasing a more grounded adventurous lifestyle. The notion of not being on the water was never a concern, as snow, glaciers, waterfalls and lakes are integral elements of the mountain landscape. “Ski every day you can in winter and swim every day you can in summer,” is my active lifestyle mantra. Skin diving at altitude is not for the faint-hearted, however, due to the extreme environment and unpredictable climate – hard hiking for at least an hour or two, being a pre-requisite to the most impressive swimming spots. 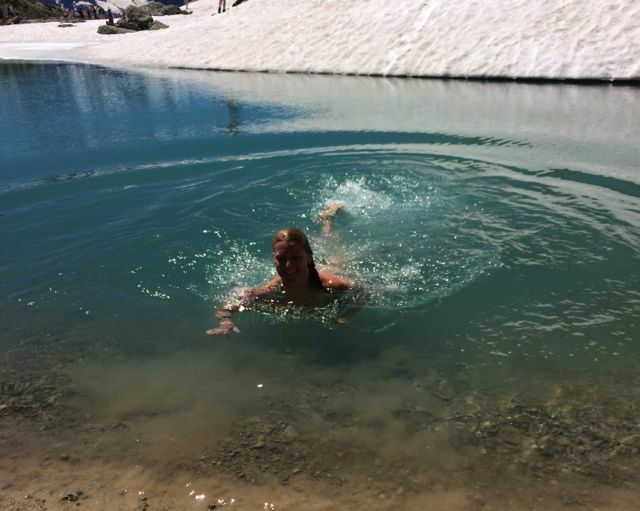 Adhering to the bikini-carrying rule, my first glacial lake dip was somewhat by chance, but actually my highest in terms of altitude. 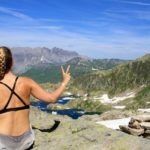 On a high summer hike from the La Flégère cable car, I defied ramblers’ expectations and went for a swim in Upper Lac Noir, situated at some 2495 metres of altitude – my first link in the chain of Aiguilles Rouges alpine lakes. It was July of my first summer in Chamonix and we were striding west along the Grand Balcon Sud, along which there are the Lacs Noirs at 2250m and 2495m, Lac Cornu at 2270m and the Lac du Brévent at 2120m; with the famous Lac Blanc at 2352m and just below that the Lacs des Chésereys from 2157m to 2211m, if you go east. We had gone a tad off-piste from the best-perceived trail, which meant we were doing a fair bit of scrambling on steeps to get through the Col de Glière and it was hot. So by the time Lac Noir Superieur came into view, my heart was racing from exertion and adrenalin, as well as the heat – I couldn’t wait to dive in. The highest lake of the Aiguilles Rouges is less than 6 metres deep, but that doesn’t make the water temperature balmy, ever. I stripped off my hiking gear and wriggled into my bikini, eyeing the sizeable névé of snow near the water’s edge. In spite of the air temperature and my own body heat, I could not endure a long dip, the iced water taking my breath away. I managed just a few quick strokes and duck-dived under the surface, before racing out to warm up on the granite banks. The feel of bathing in an utterly natural, glacial water pool was extremely bracing, yet stunning. 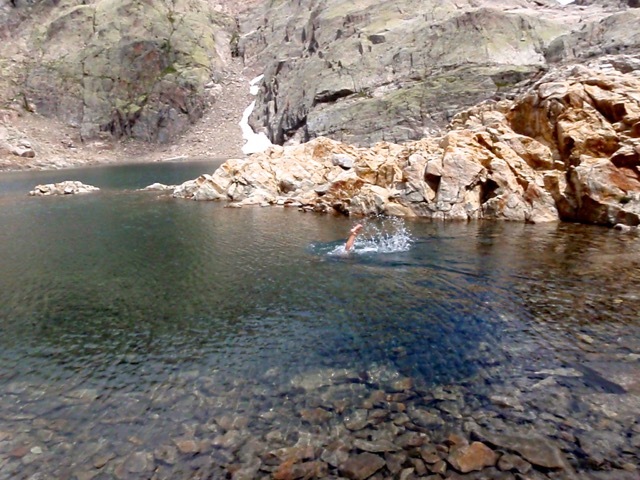 It wasn’t a lengthy alpine swimming experience, but it was certainly refreshing and energising. I felt baptised by a glacier. Trekking onwards west past the lower Lac Noir d’en Bas and then Lac Cornu, which as more northerly facing still had icebergs of snow in its waters, so I wasn’t tempted to bathe again that time. But I was hooked on the notion of dips at great heights and a summer later, I dived into Lac Blanc – bigger, higher, deeper and colder. Yet still that sensation of swimming in water so pure that you could bottle it, thrilled while it startled. Bracing myself for a somewhat snowy Lac Blanc. Ice cold baptism by glacier. 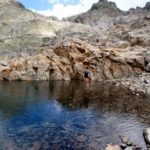 There are a multitude of high mountain lakes in the Aiguilles Rouges, but few are actually swimmable and those that are, require a rare mix of hot, settled weather and the enthusiasm for an energetic journey to reach their purifying waters. Many hikers have bathed in the Chésereys, which are also popular with extreme sports locals as a place for high altitude ‘water-lining’, or slack-lining, across. The Lac du Brévent is less frequented than Lac Blanc, but 20 metres deep and very chilly, even though it is at 220m lower. Lac Vert, west of Le Brévent, is beautiful and easily accessible at only 1270m, but swimming there is just not safe. 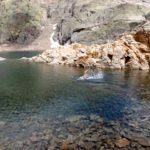 So my greatest delight in wild mountain swimming is finding freshwater pools tucked away among the peaks and troughs that are at lower altitude, clean and safe to swim in. 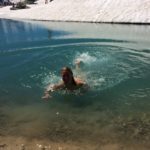 By following a winter snowshoe trail behind the sleepy hamlet of Servoz one summer’s day, I stumbled upon the most divine fairy pool I have found since bathing in geothermal waters in the wilds of Iceland. 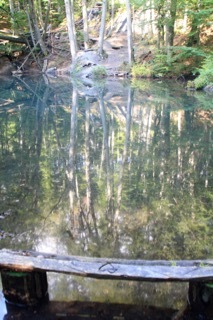 The Gouille de Pré Guy at 1040m is off the beaten track, not easy to find, crystal clear and briskly fresh. There’s a makeshift forest diving board and a tree swing to prove that local wildlings know about it, although most of those actually go for wild dips in Gouille Noire, which is also somewhat hidden but closer to the village. As I took to these near secret waters, I bathed like an alpine naiad, among the fish, the frogs and the woodland fairies – present in the form of a myriad of butterflies.